Israeli Prime Minister Ehud Olmert appears to have come close to admitting that his country has nuclear weapons. Speaking on German TV, he said Israel did not threaten "any nation with annihilation" while Iran openly threatened to wipe Israel off the map. "Can you say that this is the same level, when they [Iran] are aspiring to have nuclear weapons, as America, France, Israel, Russia?" he said. Israeli officials later denied it was a change of policy of nuclear ambiguity. Israel is widely believed to have a large stockpile of nuclear warheads, but it refuses to confirm or deny that it has a nuclear deterrent. Mr Olmert's comments came in an interview at the start of his visit to Germany, in which he was asked about Iran's alleged pursuit of nuclear weapons. As part of a long answer, he drew a distinction between countries such as Britain and the US, which he said would never threaten anyone with nuclear weapons, and Iran. "Israel is a democracy, Israel doesn't threaten any country with anything, never did. 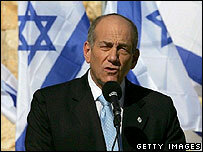 The most that we tried to get for ourselves is to try to live without terror," Mr Olmert told SAT1 television station. "Iran openly, explicitly and publicly threatens to wipe Israel off the map," he said. Mr Olmert added that the Iranians were "aspiring to have nuclear weapons as America, France, Israel, Russia" - on the surface, an explicit acknowledgement, the BBC's Simon Wilson in Jerusalem says. But Israeli officials moved quickly to deny that Israel had changed its long-held policy of ambiguity on the issue. Mr Olmert's spokeswoman said Israel's position remained that it did not discuss the issue publicly, but that it would not be the first country to introduce nuclear weapons in the Middle East. Mr Olmert's comments caused a political uproar in Israel, with some lawmakers demanding his resignation. Correspondents say Mr Olmert's interview is likely to further fuel the debate about nuclear weapons in the Middle East. Last week, the new US defence secretary, Robert Gates, used a similar form of words to Mr Olmert during a Senate confirmation hearing. Mr Gates said Tehran was "surrounded by powers with nuclear weapons: Pakistan to their east, the Russians to the north, the Israelis to the west and us in the Persian Gulf". Some in the Middle East may suspect the US and Israel are somehow working together to get Israel's nuclear deterrents out in the open, our correspondent says. But he says the fact remains that most serious military analysts have long believed that Israel does indeed possess a nuclear arsenal. The only thing that may change is what it says about it in public, our correspondent adds.